This weekend I wanted to make a fruit pie for dessert on Saturday night. It's currently not really any particular fruit season, except maybe quince and I knew I didn't have the time to cook quince. So I went with some pears which looked yummy. I followed the recipe at about.com Southern Food to the letter even though I was pretty certain it'd have problems. And it did. Line a 9-inch pie plate with pastry. Add the sliced pears. Combine sugar, flour, lemon peel, and seasonings; sprinkle over the pears. Drizzle with the lemon juice then dot with the butter. Make a lattice top; flute edges. Cover edge of pie with a strip of foil. Bake at 220°C for 25 minutes. Remove foil and bake about 10 minutes longer. To make a lattice top crust, cut rolled out dough into 1/2-inch-wide strips. Arrange 5 to 6 dough strips across top of filling. Form the lattice by arranging more dough strips at right angle to first set of dough strips, weaving the strips if you wish. Trim dough strips even with the overhang on bottom crust. Tuck ends of dough strips and overhang under; press to seal then crimp the edges. 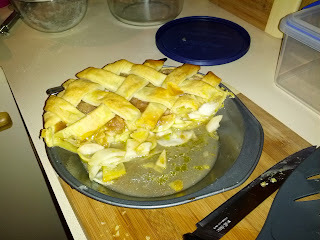 The pie was way too wet. When I pulled it from the oven - even after giving it an extra 10 minutes - liquid was slopping over the side of the pie when I tilted it slightly. I poured out about 1/2 cup of liquid before even attempting to cut it, and there was still a bunch of liquid in the bottom. The pastry on the bottom wasn't fully cooked either. It wasn't that it was soggy, it wasn't completely baked. The flavour was great but concentrated on the top - sprinkling the flour/sugar/spice mixture on the top just meant it sat there. I shook the pie a little before cooking but that didn't seem to distribute the mix much. I think I'll try this recipe again but modify it by pre-cooking the pear to reduce the liquid and combine the flavour some more, and I'll also blind bake the case. I've looked around the Interwebs to try to get some advice on what other things you can do in the face of a too-wet pie, but haven't really found anything (except cook it longer, which I intend to do...) I do wonder whether the ripeness of the pears (they were quite crisp) or the variety of pear (I'm not sure) might have something to do with it. Nothing I've read seems to indicate that's the case though.